There were 185,000 flights out of Dublin Airport last year. 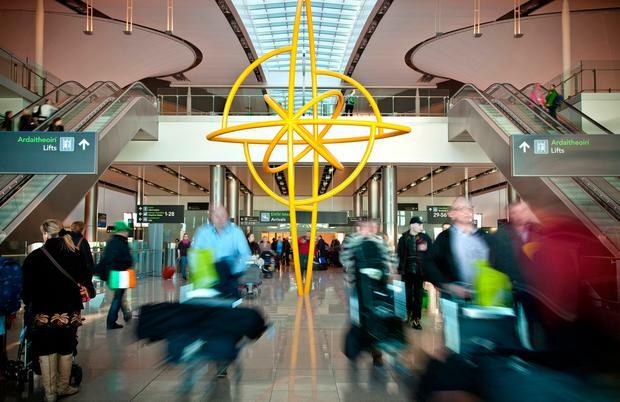 DUBLIN Airport is now the fastest-growing major airport in Western Europe, according to latest figures from Eurostat. Latest statistics show that the capital’s airport is now the 12th most popular hub for arrivals and departures in the entire EU. Significantly, passenger numbers in Dublin grew by 15pc last year, making it by far the fastest-growing airport in the EU’s top 20. There were 185,000 flights out of the airport last year. “Last year we were helped by a major growth in our transatlantic routes and that has hugely helped passenger numbers. That has continued this year and we have grown by 12pc of the first three-quarters of this year,” said DAA communications chief Paul O’Kane. The capital’s airport had more than 24 million passengers last year, which takes it above Brussels, Stockholm, Lisbon and Manchester. London Heathrow was Europe’s most-used airport, with 75 million passengers. Paris Charles de Gaulle was second on the list with 65 million, while Frankfurt, home of the European Central Banks and a major economic hub in Germany, was third with just over 60m. The other airports in the top 10 were Amsterdam/Schipol, Madrid/Barajas, Munich, London/Gatwick, Rome/Fiumicino, Barcelona/El Prat and Paris/Orly. The most frequent flights between countries were between the UK and Spain, which accounted for 9.1pc of all air travel journeys within the EU, with almost 36m passengers. Travel between Spain and Germany was the next most popular route, with 25 million people making the journey, accounting for 6.3pc trips taken within the EU. The UK to Germany was the third most popular journey for EU travellers, with over 13m passengers. The statistics show that journeys between the UK and Ireland were the ninth most frequent in the EU, with 11.6m people making the trip. Trips to other European countries outside of the EU accounted for the most amount of external flights, with 127m passengers travelling to and from other European states. North America was the second most frequently used non-EU destination, with 65m arriving from or leaving for the US or Canada, accounting for 4.3pc of external trips. There were 12m trips to and from South America, while 41 million travellers made the journey between the EU and the Middle East. Surprisingly, the number of travellers coming to and going from Australia declined last year, with just 681,000 journeys. The country’s other airports are lagging well behind when it comes to air traffic. Cork is Ireland’s second-largest air travel destination, however the airport saw traffic decline slightly to two million last year. Traffic at Shannon airport rose to 1.7 million. Last month the airport announced that German carrier Lufthansa will operate a new route to Frankfurt from next year. “This is a significant milestone for our airport and region by one of the world’s major airlines. Germany is Ireland’s third-largest source of visitors and the addition of this new Frankfurt service is great news for the Irish tourism industry,” said Matthew Thomas, ceo of Shannon Group.